In World War I England, Styles mansion residents awake to find Emily Inglethorpe fatally poisoned. Guest Captain Hastings enlists his old friend, Belgian detective Hercule Poirot, of the magnificent mustaches. Although evidence mounts against one family member, Poirot uses the unique deductive technique of his "little grey cells" to find the truth in his first appearance. Recommended for fans of John Grisham, James Patterson, Janet Evanovich, Scott Turow and David Baldacci. . . .It fitted, and he opened the box, but after a moment's hesitation, closed and relocked it, and slipped the bunch of keys, as well as the key that had originally stood in the lock, into his own pocket. "I have no authority to go through these papers. But it should be done—at once!" He then made a very careful examination of the drawers of the wash-stand. Crossing the room to the left-hand window, a round stain, hardly visible on the dark brown carpet, seemed to interest him particularly. He went down on his knees, examining it minutely—even going so far as to smell it. Finally, he poured a few drops of the coco into a test tube, sealing it up carefully. His next proceeding was to take out a little notebook. "We have found in this room," he said, writing busily, "six points of interest. Shall I enumerate them, or will you?" "Oh, you," I replied hastily. Characters: Hercule Poirot, Inspector Japp, Arthur Hastings, John Cavendish, Emily Inglethorp, Alfred Inglethorp, Cynthia Murdoch, Mary Cavendish, Evie Howard, Lawrence Cavendish. Ok. Let's get down to business. This is an old fashioned British mystery novel. So much information! Trying to keep it all straight in my head was extremely difficult. My brain was all over the place but that's what makes a good mystery, in my opinion. 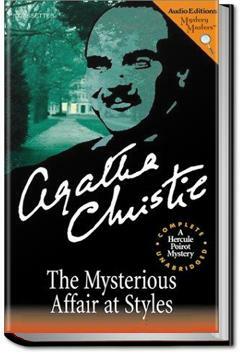 This is the first installment in the Hecule Poirot series and was just as brilliant as every other detective book I have read by the undoubted Queen of crime fiction!